Despite winning the election and making it to the White House, President Donald Trump is turning out to be one of the most controversial and publicly vilified US Presidents ever to be elected into office. Barely a month since moving into the White House, Trump and his list of cabinet appointees have drawn an astonishing volume of hatred from all sides! He and his beautiful, successful family has had to endure an endless stream of media bullying which defies common decency… from vulgar naked statues of Trump being erected in the city to below-the-belt remarks about his children; not to mention libelous assertions made about his wife Melania and the list of fashion designers who campaign against ‘dressing’ her! At the time of writing, retail businesses have begun boycotting Ivanka Trump’s line of clothing and soon to follow will be the dumping of Trump-branded homewares, thanks to campaigns from anti-Trump activists who encourage citizens to stop buying their products. It is really very sad to wake up every morning to a stream of Twitter and Facebook feeds from friends of mine whom I know personally to be the kindest and most decent people, yet are able to dish out terribly hateful remarks at their duly-elected President and his children. It’s almost as if half the nation of America are under some kind of hate spell… and at this stage, I doubt that President Trump can do anything “right” in the media’s eyes and those who were against him from the start. Every remark made and every action taken by President Trump is sure to provoke condemnation from one side or another; which begs the question – how long should he continue doing this! Definitely he does not need the money or the clout that comes with the Presidency. He and his family were doing just fine and dandy before he decided to run for office! 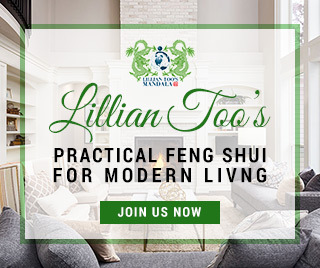 This prompted us to take a look at the feng shui of the White House, the iconic building that has been the principal residence of the leader of the “free world” since the 1800s. Soon after Donald’s election victory was confirmed, he and his wife Melania made no secret of their plans NOT to move into the White House full time. This has of course drawn widespread criticism from the media as well as government agencies that question the practicality and cost of providing security detail for the President while he is not in the White House. But Trump is perfectly within his legal right and personal liberties to decide where to live. There is no law that requires the Commander-in-Chief to reside in the White House. And he is not asking to do something so unconventionally new; many past Presidents have been known to split their time between the White House and other semi-permanent residences. G.W. Bush for example, was known to spend more than a-third of his presidency outside the White House at his ranch in Crawford, Texas, Camp David and his parents’ home in Kennebunkport, Maine. George Washington never lived at the White House at all, and recent presidents in the last 50 years have had designated temporary residences (usually referred to as the “summer White House” or “winter White House”) in which they vacationed or conducted official business. Nevertheless, the level of loathing for Trump’s administration is no longer confined to activist campaigns and media scrutiny. Congress and the Judiciary are initiating serious action to block his Executive Orders. This has serious long-term consequences and sets a precedent for other branches of power to undermine the authority and validity of the Executive Branch. Many in Congress are just waiting for the perfect moment to leap at something they can use to impeach Trump and to dislodge him from the White House. For sure, if President Trump wants to get on with the business of governing the country and initiating changes that will really transform the economy, increase national security, and push ahead with his radical reformation of international relations, he needs much greater support from Congress, from the Judiciary, from the media and definitely, from his people. For all this to happen, the energy has to shift in his favour. President Trump is entering the White House in a year when the energy of the flying stars are working against him. To start with, Trump who is the Patriarch and born in the year of the Dog is afflicted by the illness #2 star, which flies into his zodiac palace in the Northwest. One has to marvel at the level of energy and guts Trump displays on a daily basis to defend his actions against those who oppose him. Nevertheless, his spirit essence, life force and lungta are all at very average levels, and it is likely he may well succumb to illness if he is not careful. This year, the #3 hostile star of WAR afflicts the West location. 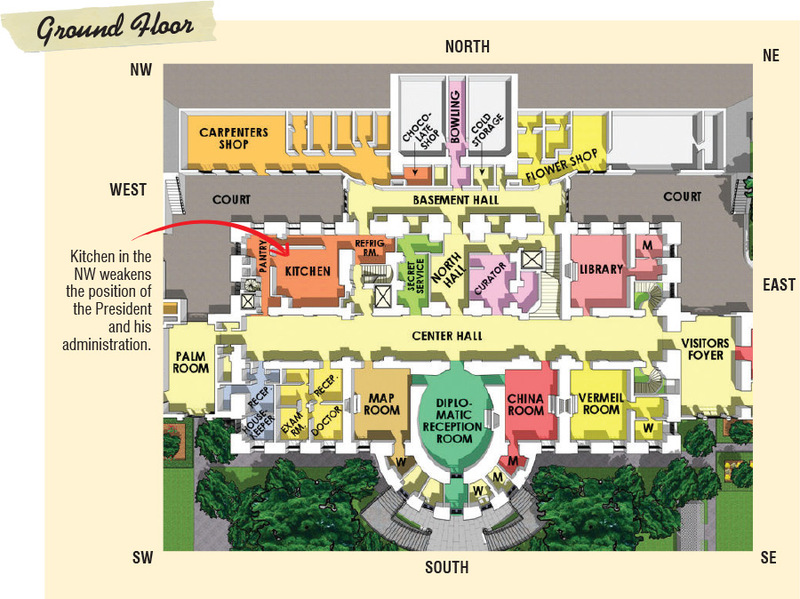 In terms of the overall layout of the White House, it lands squarely in the WEST WING, where the President conducts all his business of running the country. Last year, President Obama was able to leave office on a high note, thanks to the Popularity Star #4 which permeated the West Wing. But this year, Trump enters office with a great deal of angry and divisive energy dominating this part of the building, and it is no surprise that his administration is taking such a lot of heat for every move they make. The #3 is a Wood element star that brings legal issues and combative energy; it should be suppressed with the use of Metal and Fire energy. 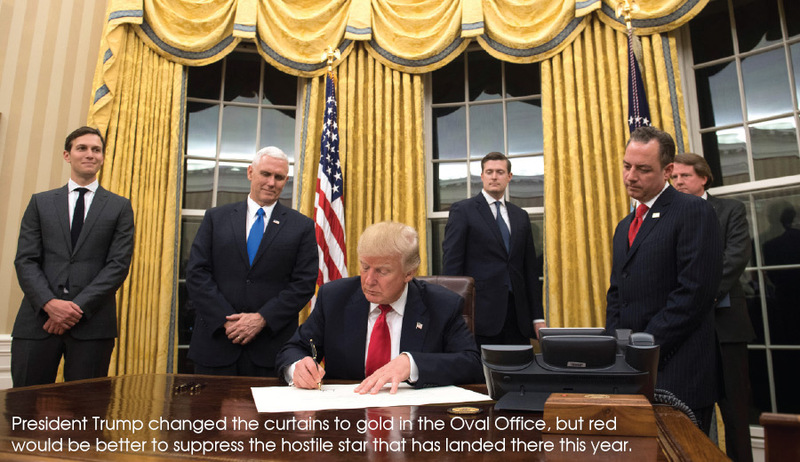 It would seem that Trump might have received some feng shui advice, as the first thing he did since moving into the Oval Office was to change the curtains into GOLD and replace the carpet with a “sunburst” beige design. But evidently, this has NOT been sufficiently strong to curb the #3 star! What the Oval Office needs right now is some bright red energy and the presence of the Eagle! The cure for the #3 star this year requires the victorious might of the King of Birds, so Mr Trump, it is time to bring back the Eagle that got you elected in the first place! And while you’re at it, change the carpet to a bright red! One of the problems with the design of the Oval Office is that the President’s desk is always placed in such a way where his back is left exposed towards the window. 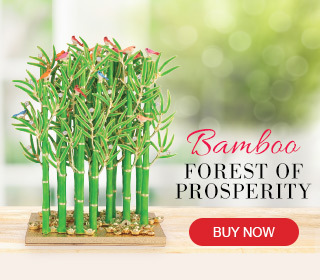 In classical feng shui, this is an incredibly weak position for the leader of a nation, and it is no wonder that every President that has worked out of the Oval Office has had to struggle to get his policies through Congress. The window behind the desk should either be closed up, or the President’s desk should be moved so the President sits with a solid wall behind him. The best scenario is for the wall to feature a large mountain, as this will bring great support to the President and everything he endeavours to undertake. 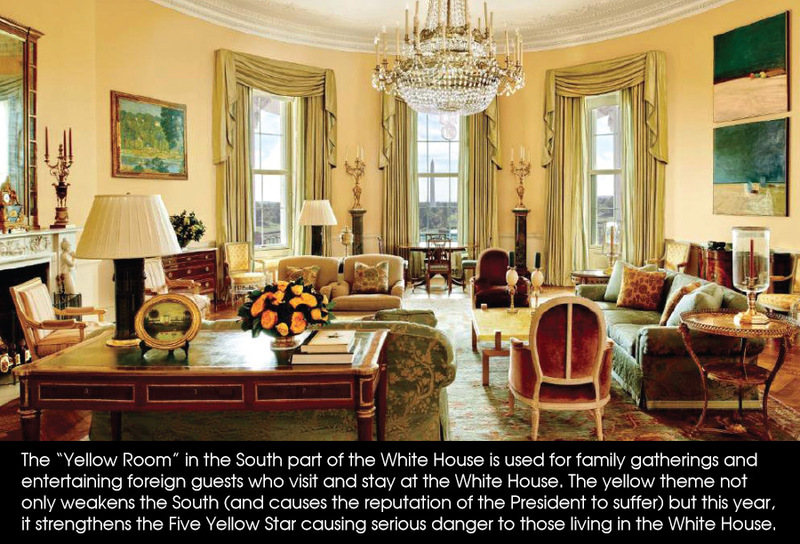 Moving away from the Oval Office, we also examined the feng shui of the main White House residence, where the President and his First Lady live throughout the duration of his presidency. Here, there is a serious feng shui flaw that undermines the health and judgement of all male American presidents. On almost every floor, the Northwest has been fitted with a KITCHEN. The main White House kitchen is located in the Northwest of the basement level; but over the years, a small kitchen has been added to the Northwest location of every floor. Having a kitchen in the Northwest weakens the Patriarch significantly – and in this case, it is the President of the U.S. whose health and judgement will be affected, and this has a spill-over effect on the U.S. as a whole. Until 1962, the Northwest of the second floor (where the first family lives) featured a large bedroom known as the Prince of Wales Room and was the only floor that did not have a kitchen. But in 1962, Jackie Kennedy had this part of the house converted into a kitchen and dining area, which in effect caused the entire Northwest corner of every floor to be occupied by a kitchen. Less than a year after this renovation, her husband President John Kennedy was assassinated. Almost every President that has lived in the White House since then has either suffered from illness or scandal, and each had to go through a tremendous amount of adversity to get their policies passed. Having a kitchen in the Northwest creates the trigram formation known as Fire at Heaven’s Gate which can be deadly for the Patriarch. 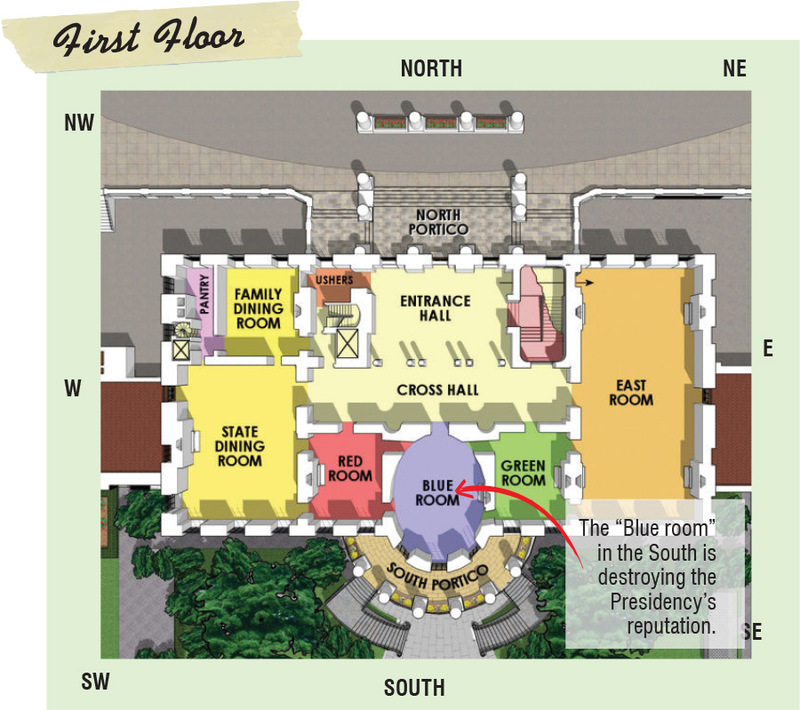 This is one feature that must be changed to safeguard all future Presidents of the U.S.
One of the most famous rooms in the White House is the oval-shaped BLUE ROOM on the first floor, which takes its name from the opulent blue décor put in place by Martin Van Buren’s administration in 1837. The room is beautifully furnished with royal blue carpets laced with imperial yellow trimmings, but sadly, as beautiful as it may be, this isn’t the best sector for this room! 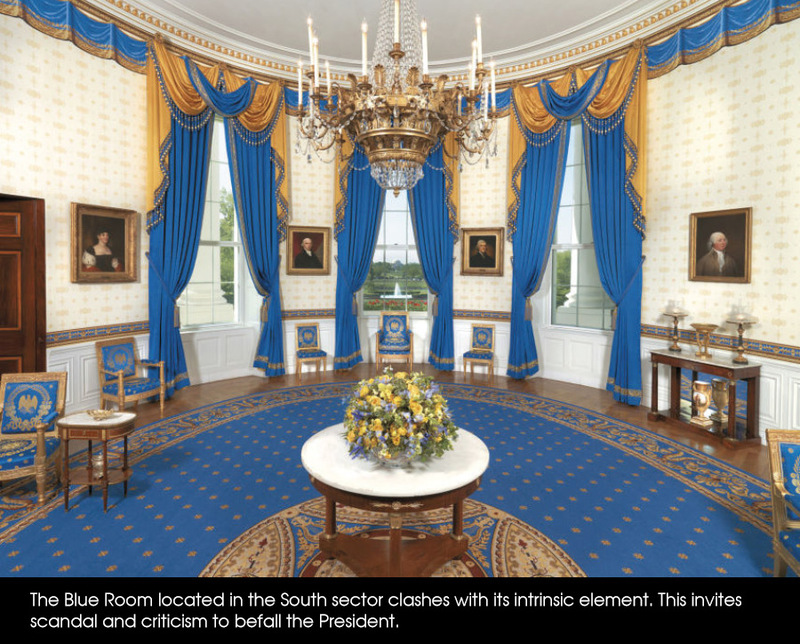 The Blue Room embodies the element of Water but it occupies the SOUTH location of the White House, a palace whose main element is FIRE. The South is the palace of REPUTATION and FAME, thus having water in this location diminishes the good name of the Presidency. This is further exacerbated, as directly above the Blue Room is another room known as the Yellow Room (Earth). In the feng shui cycle of elements, Earth exhausts Fire, thus having an Earth-themed room here further weakens the South location! And this year, the South is afflicted by the dangerous Five Yellow Star of Misfortune, which gains strength from Earth energy! The President’s bedroom is located in the Southwest of the building. Unfortunately, this room is not suitable for President Trump as his Kua number is 9, thus he is an East Group person. Under the Kua Formula, the Southwest is Trump’s Six Killings location; sleeping here in the long term will impair his good judgement and harm his physical and mental well-being. Hopefully, Trump is able to sleep with his head pointed towards at least one of his auspicious directions, but he is much better off moving to the Lincoln Bedroom in the Southeast, which is his Health location. 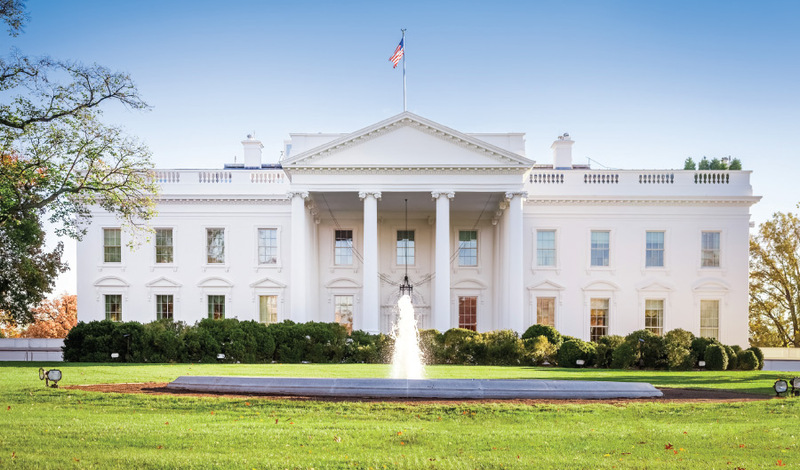 Definitely, the White House could do with a major feng shui renovation that will go a long way towards restoring the authoritative power of the Presidency. This would be the perfect project for someone as elegant and tasteful as First Lady Melania Trump, who is sure to do a brilliant job if given the chance! 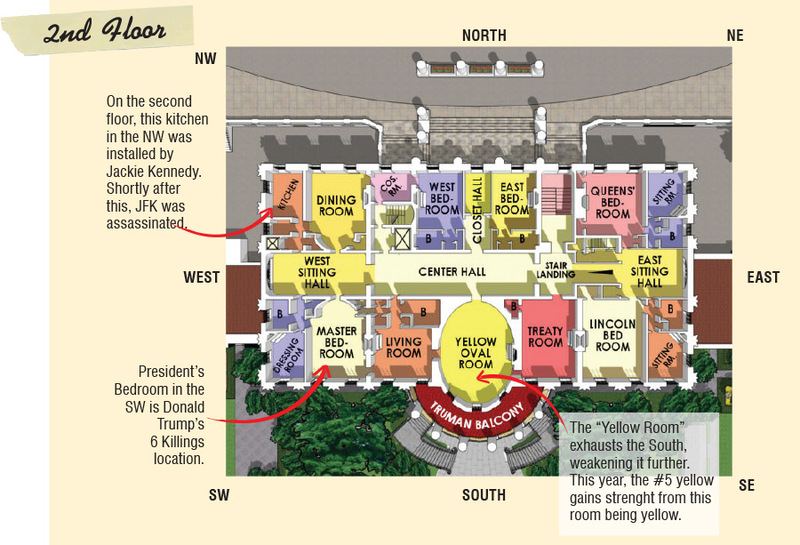 Most critical now is to look for other locations to relocate or demolish the kitchens in the First and Second floors; for as long as the kitchens remain in the Northwest corner of every floor, every male President living here is sure to suffer terribly.